Calibration is essential to ensure consistency and build confidence in call monitoring results. The best way to gain consensus on a call is to design the proper review criteria and then test it over and over. Group discussions comparing and discussing results help to focus and clarify the not so easy task of judging performance, and they also build confidence and consistency. Calibrate until all members conform to standard. Even if you don’t have a dedicated QA group, calibrate among your supervisors or leads to make sure everyone is on the same page and providing consistent evaluation and guidance to representatives. 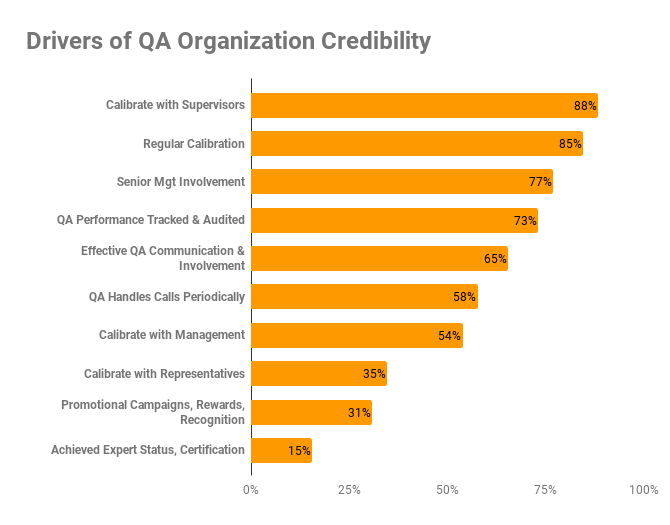 Our benchmarking research reveals that regular calibration and calibration with Supervisors are the top two key drivers of QA organization credibility. Including supervisors in the loop makes sure they are aligned with QA, and visa versa. Other drivers mentioned frequently in our call quality practices benchmarking: effective QA communication and involvement, senior management involvement, calibration with management, and the auditing and tracking of QA group performance. Some companies report that they require QA employees to spend time answering incoming calls each week or periodically, in order to keep them in tune with the front-line’s perspective. Others calibrate periodically with representatives or rotate representatives into the Quality organization, as both a development tool and to foster a hands-on understanding of the monitoring process. Be sure to educate agents on the monitoring processes—especially how calibration sessions develop consistency and hold monitors accountable for the evaluations they render. The measures and the measurement process must be meaningful to employees so they are encouraged to change their behaviors. Consider rotating seasoned representatives into a monitoring role to cross-train and provide first-hand experience with the process. Include representatives and supervisors in calibration sessions to further educate them on the process. Track and promote the successes you’ve achieved as a result of your monitoring efforts. One sure way to improve monitoring skills and bolster confidence is to monitor the individuals responsible for call monitoring—listen to the calls they evaluate, compare evaluations, and coach. This technique instills accountability and offers continual improvement opportunities.